This species is accepted, and its native range is E. Kenya to NE. Mozambique. Leaves opposite or subopposite; petiole 3–7 mm long; lamina thinly coriaceous, dark green, mostly 3–11 × 2–6.5 cm, ovate-elliptic to elliptic, narrowed or acuminate to acute or shortly rounded apex, cuneate to rounded at base, lowest on side branches smaller and more obovate, with 6–12 pairs of lateral nerves, the lower ones stronger and more ascending Leaves opposite or subopposite; petiole 3–7 mm long; lamina thinly coriaceous, dark green, mostly 3–11 × 2–6.5 cm, ovate-elliptic to elliptic, narrowed or acuminate to acute or shortly rounded apex, cuneate to rounded at base, lowest on side branches smaller and more obovate, with 6–12 pairs of lateral nerves, the lower ones stronger and more ascending. Berry red, not seen. Berry red, not seen. Habitat not recorded in Mozambique but in dry evergreen forest and associated bushland further north, flowering mainly during the rains. Stems spreading and pendent to 1 m, often with rather short lateral branches; branchlets slightly compressed at first, soon terete; plant glabrous. Stamen filaments dark red or purple; tooth 0.5–0.7 mm long; anthers 2–2.5 mm long. Style green, slender, only slightly narrowed above; stigma 0.7–0.8 mm across, capitate. 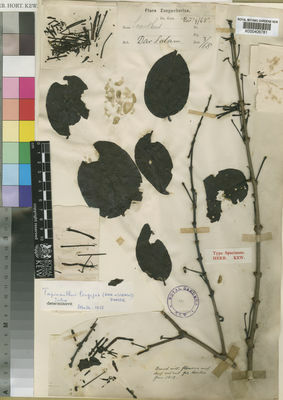 Stems spreading and pendent to 1 m. long, often with rather short lateral branches; branchlets slightly compressed at first, soon terete; plant glabrous. Leaves opposite or subopposite; petiole 3–7 mm. long; lamina thinly coriaceous, dark green, mostly ovate-elliptic to elliptic, 3–11 cm. long, 2–6.5 cm. wide, lowest on side branches smaller and more obovate, narrowed or acuminate to acute or shortly rounded apex, cuneate to rounded at the base, with 6–12 pairs of lateral nerves, the lower ones stronger and more ascending. Umbels axillary or terminal on short branches, 4–8(–14)-flowered; peduncle 1.5–4 cm. long; pedicels 2–4 mm. long; bract saucer-shaped with a small triangular-ovate limb 1.5–2.5 mm. long. Corolla 3.5–4.5 cm. long, tube pink or pinkish mauve (sometimes white below), often darker lined, then green with head yellow or green in bud, ± darker marked around vents; lobes green inside; apex of bud ovoid-ellipsoid to ellipsoid, angled, slightly ribbed, pointed or slightly acuminate at the apex, 3–4 mm. long, 2–2.5 mm. in diameter; basal swelling slight; lobes erect, 10–11 mm. long, the upper expanded part narrowly elliptic, 4 mm. long, 1.2 mm. wide. Stamen-filaments dark red or purple; tooth 0.5–0.7 mm. long; anthers 2–2.5 mm. long. Style green, slender, only slightly narrowed above; stigma capitate, 0.7–0.8 mm. across. Coastal forest and associated bushland; 30–650 m.
Polh. & Wiens, Mistletoes Afr. : 151 (1998).